(Nova II#8) - When Nova prevented the hijacking of an US satellite from a team of the Shadow Consortium, Warhead and Shatterforce were sent to dispatch Nova. Using their Spincraft, a hi-tech flying vehicle, Shatterforce followed the energy track that Nova had left and reached the cabin where Richard Rider and his friends were having a barbecue. The cabin was destroyed and Nova had to reveal and defend himself. Shatterforce's simultaneous attacks were truly effective and Nova was rendered unconscious, leaving him defenseless for Warhead's final blast. (Nova II#9) - In the meanwhile, Bernie and Caps, Richard's friends, succeeded in tinkering with the Spincraft and piloting it well enough to distract the criminals. Nova was able to escape and continue the battle with Warhead and Murder. Strangler breached into the Spincraft and almost caught up with the two boys when Nova flung him outside for a long fall. But Warhead promptly recovered from Nova's gravimetric pulse, and, crackling of burning energy, bashed into the ship. Warhead had a grudge against Nova, for past events, so his blind attack seriously damaged the Spincraft. The flying ship exploded with Warhead inside while Nova saved his friends and fled home. (Nova II#12) - Shatterforce stayed hidden, Dwayne Tayolor and Chord tried to connect then to the Shadow consortium. (Nova II#13 - BTS) - The Shadow Consortium retrieved Shatterforce, reviving Warhead. (Nova II#13) - Shatterforce was fixed up and received improvements, while the Shadow Consortium was bargaining an alliance with Condor. (Nova II#14) - Shatterforce was taken off from the Nova Sanction, Planner had reassigned the mission to their Aakon allies. Warhead, still seeking revenge menaced the aliens but was easily beated by one of them. Shortly after Nova led the New Warriors to the Consortium's Appalachian base, Shatterforce stopped them for a while but they were almost defeated when a bomb set up by Daakor the Aakon detonated. Shatterforce's members were alive but unconscious. (Nova II#14 - BTS) - The members of the Shadow Consortium who didn't die and didn't escape to Mars were taken into custody by the SHIELD. Comments: Created by Chris Marrinan (writer and pencils), Mark Stegbauer (inks), Tom Smith (colors). Warhead reckoned that he died two times. I suppose the first time on the electric chair; the second on the Spincraft. It is likely that the Shadow Consortium used alien technology to raise him from death. The fact that he believed to have had a brother he never had was never explained. False memory implants? For what purpose? Nova captured bank robbers in his early apparitons in Nova I#2, #5 and #13. One of them could be Slivovitz. It is likely that Murder and Strangler underwent a treatment similar to the one which empowered Warhead. All the members of Shatterforce were reckless. Warhead was more concentrated on the mission but lost his temper when confronted by Nova. The other two were less professional and seemed even cruel as if they liked killing and inflicting pain. or any other "force" group or character. or any other "war" or "head" character. or any other "murder" character. Strangler has no known connections to any other character with a similar name. Powers/Abilities: The equipment and the armor worn by Warhead gave him superhuman strength (Class 10) and proportional durability. He could fly thanks to jets from in his boots, which he also used as blasting force. His weaponry included power blasts from his gloves and a glowing, burning aura which surrounded his whole body, increasing the effectiveness of his blows and of his defenses, becoming nearly invulnerable. In order to attain the lethal potential, and the glowing, flaming aura, Warhead needed some seconds to charge to collect enough energy. He could also focus the power in a hand in one second, enabling him to cut through rock like butter. Some parts of his armor needed coolants and lubricants to work at full efficiency, and parts of his body were synthetic. He was 8'2" tall. History: (Nova II#13 (fb) - BTS) - Gregory Slivovitz was a bank robber. During a theft, Slivovitz was captured by Nova, who was in the early years of his career. Slivovitz was convicted but escaped, killed a family of four and was executed in an electric chair after he was caught again. (Nova II#8) - Years passed and Slivovitz was resurrected as an enforcer by the Shadow Consortium under the name of Warhead. He sought revenge against Nova whom he believed to have killed his brother. 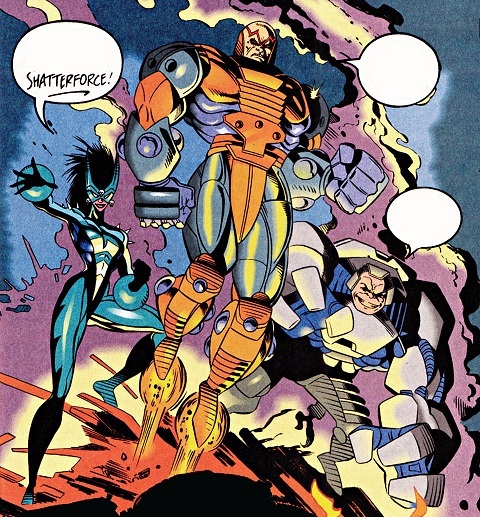 Warhead, who led Shatterforce, received orders to eliminate Nova. He was happy to oblige, sure that he'd collect his revenge. Shatterforce could find Nova following the trail of some particle charges left behind him. Because of his previous battle with other members of the Shadow Consortium. They landed the Spincraft near the little house where Rich Rider and two friends were, then they destroyed the cabin, forcing Rich to transform into Nova. Warhead tried to shoot Nova down, but he was too quick for Warhead though not for Murder. Weakened by Strangler and Murder, Nova had to endure Warhead's vengeful blows. He could still counterattack for a while before being knocked out by Murder's blasts and Warhead's punch. (Nova II#9) - Warhead and Murder waited for some moments in order to charge their for their final blow with deadly potential and incinerate Nova, but they were distracted by the Spincraft, just in time for Nova to recover. Warhead resisted to Nova's blow, but when the Hero unleashed a gravimetric pulse, Murder and Warhead were knocked down. Only a few moments later Warhead was up again and reached his lethal potential, attacking Nova on the Spincraft. Warhead's power and rage held Nova at bay for a while until his maximum power was used up and he was entrapped on the Spincraft. Refusing Nova's help he fell with the ship, which exploded, killing Warhead. (Nova II#12) - Chord and Dwayne Taylor started to research about the Shadow Consortium starting from what they knew about Warhead. (Nova II#13) - Warhead was revived again by the Shadow Consortium and received fixes and improvements. He donned a new, far more powerful armor. (Nova II#14) - Shatterforce was taken off from the Nova Sanction protocol as Planner had reassigned the mission to their Aakon allies. Warhead, still seeking revenge against Nova, menaced the Aakon but one of them blasted him with an energy blast leaving him behind unconscious. Shortly after Shatterforce had to attack the Nwe Warriors, who invaded the base. 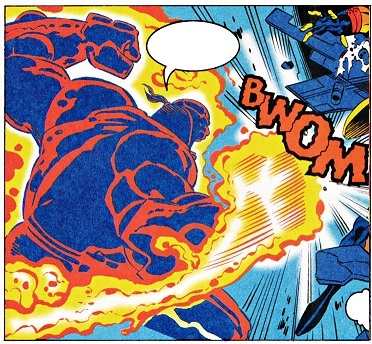 Warhead was beaten again by Nova, but the final blow was given to him by an explosion set up by Daakor of the Aakon. Shatterforce's members were alive but unconscious. (Nova II#14 - BTS) - Warhead was taken into SHIELD custody. Powers/Abilities: The armor she wore was not only a protective suit which gave her enhanced strength and durability. From the spheres on her wrists she could shoot Nerve Rays. The green, sizzling charges had the effect to paralyze and stun an opponent, if taken in little quantity. 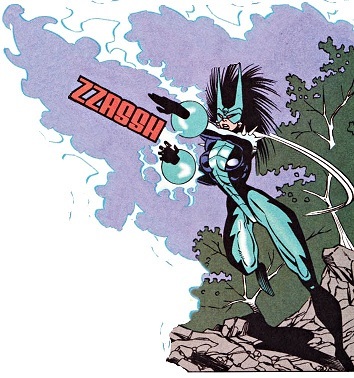 Concentrating for a few seconds, she could amplify their force, attaining lethal potential, allowing her to reduce a human body to ashes with one blast. She could also control the Nerve Rays to surround her hands for slashing with a deadly touch. Shatterforce could find Nova, following the trail of some particle charges left behind by him, in a previous battle with other members of the Shadow Consortium. They landed the Spincraft near the little house where Rich Rider and two friends were, then destroyed the house, forcing Rich to transform into Nova. Murder was the only one who succeeded in hitting Nova, with her Nerve Rays. Shatterforce's combined attack put Nova in serious trouble, and Murder was striking with her deadly touch when Nova freed himself for a while. A new blast from Murder's hands felled the hero. (Nova II#9) - Warhead and Murder waited for some moments, in order to reach lethal potential and incinerate Nova, but they were distracted by the Spincraft, just in time for Nova to recover. Nova knocked Murder out with a gravimetric blast. (Nova II#13) - Murder and Shatterforce were fixed and received improvements by the Shadow Consortium. (Nova II#14) - Shatterforce was taken off from the Nova Sanction as Planner had reassigned the mission to their Aakon allies. Shortly after Shatterforce had to intervene against the New Warriors, who invaded the base. 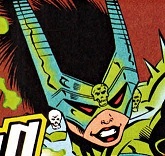 Murder hurt Kymaera with her Nerve Blasts at full intensity but was defeated by Darkhawk. The final blow was given by the explosion set up by Daakor the Aakon. Shatterforce's members were alive but unconscious. (Nova II#14 - BTS) - Murder was taken into custody by SHIELD. Powers/Abilities: Strangler possesses superhuman strength (Class 10) and durability. Strangler had an electro-shock touch which he used in conjunction with his grip. He was 8'2" tall; with his huge size he was neither agile nor quick, limiting his degree of effectivenes to close and hand-to-hand combat. Shatterforce could find Nova, following the trail of some particle charges left behind by him, during his previous battle with other members of the Shadow Consortium. They landed the Spincraft near the little house where Rich Rider and two friends were, then destroyed the house, forcing Rich to transform into Nova. Strangler was defenseless against Nova's speed and could intervene only when Murder slowed him down. His electro-shock touch was not as effective against Nova, but his grip was unbreakable. Nova played possum and it worked as Strangler let him go and the hero was able to resume the battle. The alarm of the Spincraft was triggered by Nova's friends and Strangler entered the craft to kill the intruders. (Nova II#9 (fb) - BTS) - Strangler entered just when Caps and Bernie took off. The door closed automatically and Strangler's arm got wedged in the door, with Strangler dangling outside. The Spincraft's maneuvers gave Nova the distraction needed to renew his forces, while Strangler made his way through the hull of the Spincraft. He had almost reached the two boys when Nova arrived and hurled him outside for a long fall. Nova also defeated the rest of Shatterforce and fled. (Nova II#13) - Strangler and the rest of Shatterforce were fixed and received improvements. (Nova II#14) - Shatterforce was taken off from the Nova Sanction, Planner had reassigned the mission to their Aakon allies. Shortly after Shatterforce had to intervene against the New Warriors, who invaded the base. Strangler tried to help Warhead against Nova, but was nearly overhwlmed by the hero's fury. The final blow was given by the explosion set up by Daakor the Aakon. Shatterforce's members were alive but unconscious. (Nova II#14 - BTS) - Strangler was taken into custody by SHIELD.